The MS in Sustainable Design program is committed to providing a selection of highest quality resources to support the program’s work. All resources are free and are accessible by students in the program on campus or via a VPN connection. Jaime Lerner, Sim Van der Ryn, Van Jones, Mark DeKay and John Todd. LEED Reference manuals for New Construction, Commercial Interiors, Operations and Maintenance and Homes Building Green Suite including access to the all Environmental Building News issues, Green Spec and BuildingGreen.com resources International Green Building Code and ASHRAE guides (these resources are available for on-campus students). On-line students can access the Gutman Library's databases including Green Spec via a VPN connection. Full site license to all AutoDesk products including Revit, AutoCAD, Ecotect and Green Building Studio – these become available through AutoDesk University once registration in the Program is complete. Building simulation tools including Equest and IES: Integrated Environmental Solutions. IES is free to use in the Computer Labs. Students must pay a fee to download the software to their personal computer. 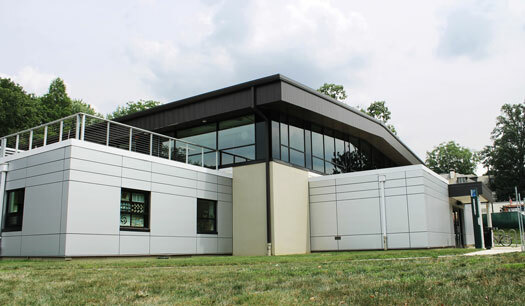 The Center for Sustainability, Energy Efficiency and Design (SEED) is home to the College of Architecture and Built Environment graduate programs, including the M.S. in Sustainable Design program. The Center is an innovative, multi-disciplinary space that serves as a regional resource for architects, engineers, builders and developers by offering specialized training, sustainable building design strategies and green product/material integration. The SEED Center features studio space, smart classrooms, fabrication facilities, a CAD lab, seminar space and faculty offices. The building also features an interactive energy monitoring screen that will provide real-time information on the building’s energy usage and carbon footprint. The City of Philadelphia is a nationally recognized leader in sustainability. The city features an ambitious stormwater plan, new ordinances to drive green construction, and a series of plans to make Philadelphia the "greenest city in America." With Grid Magazine and numerous local green organizations, the City offers a rich and vibrant sustainable community - a perfect place to get a masters degree. Living options range from small apartments within walking and biking distance to campus to the vibrant Manayunk Section of the city to the residential neighborhoods of Roxborough, Germantown, Mt. Airy and Chestnut Hill. Some students live in Center City (15 minute drive to campus) or Olde City which offers world class amenities within walking distance.